Putting makeup on is great and everything, but nothing beats that feeling of getting in after a sweaty tube ride and taking it all off again. There's just something about fresh clean pores, complete with a messy topknot and pjs of course, that just fills our hearts with utter joy. That said, we also know that gentle and effective makeup removers are hard to come by. This time round we're testing B. Effective Stubborn Makeup Remover. Let's see how it scrubs up! I'm about as fussy with my makeup remover as Monica is with her towel categories, so you could say I am a hard woman to please. I have really sensitive eyes, so anything overly perfumed or involves excessive rubbing, sends them crazy and I end up looking like I've done 12 rounds with Mike Tyson. Luckily, I had no such problem with B's makeup remover. It was really gentle and light on the skin but effective enough to remove my mascara - and even that stubborn eyeliner that insists on sticking around on the roots of your bottom lashes. I always like to remove my makeup first and then follow up with a foaming cleanser or cleansing balm but using this product alone would do the job! There's nothing that makes me more angry than trying to get my makeup off at night. It's boring, and no matter how long I scrub at my lashes, there's always still a tiny bit of mascara that clings to the skin under my eyes. I'm sick of it. Even if I scrubbed and scrubbed until I had no eyelashes left, until I'd rubbed away my entire lid right down to the eyeball, guaranteed I'd still manage to find remnants of Benefit's Roller Lash mascara sprinkled down my cheeks. I give up, guys. Ok? I give up. I'll just wear this one coat of mascara for the rest of my life because I'm done with trying to remove it. But for the purpose of this review I had to try B. Stubborn Makeup Remover. And you guys - it ain't half bad. I have really great skin, it's sensitive and blotchy and allergic to just about everything and the kind that all girls dream of having. Lucky me. But B. eliminates the need for scrubbing and didn't aggravate my skin. And good news for all you tightwads out there: I didn't even need to use that much to get rid of my makeup, so this bottle will last you ages. Perf. I am 'the worst' when it comes to removing my makeup properly - a couple of splashes of water to the face and job's a good'un (I'm going to hell, I know). I'm always so sceptical of makeup removers and my eyes are the kind that punish you for days after any amounts of rubbing, hence my lazy skincare routine. But B. Effective Stubborn Makeup Remover requires no such effort and it's as effective as it claims to be, removing the most difficult of mascara and eyeliner remnants with just a few good wipes. The smell is light (a vague cucumber tang) and the cleanser kind to your skin - you don't feel as though you've coated it in a heavy product. Hopefully, in a few years time we'll have a robot to do this menial task for us but this is the next best thing while we wait. Just like exercising and paying bills, removing makeup is far from my favourite activity - particularly after a few bevvies at 4am, which ALMOST makes me kinda wish I never put it all on in the first place (I said kinda.) I'm guilty of turning to my good old friend the humble wet wipe at least a few times a week (I'm sorry), so I need something that's super quick and easy at tackling my fifty layers of mascara and bronzer for me to even give it a chance. The makeup removers and cleansers I've tried in the past have been no match for stubborn mascara, sometimes leaving it hanging around for days, so I'm so thankful for this gem which made removing the lot a doddle. It's light texture didn't dry out my sensitive skin or irritate my eyes, which is a bonus, so it's now a firm fave in my beauty routine. I’m used to sitting at my dressing table, 20 cotton wool pads deep trying to remove my eye makeup with just about any cleanser I can get my hands on. But thankfully the B. Stubborn Makeup Remover makes it super quick and easy and I don’t have to sit there for hours on end any more (slight exaggeration). It has an oily dual-phase formula similar to the cult Instant Makeup Remover from Clarins which is a fave with beauty bloggers but this one is less than half the price. I’m also all about it being 100% vegan and cruelty free because I can sleep safe at night knowing that no little bunnies were hurt, just so I can remove my 12 layers of mascara. Rumour has it B. will be launching new make-up as well later in the year so I’ll be the first one queueing up at Superdrug to get my hands on it. 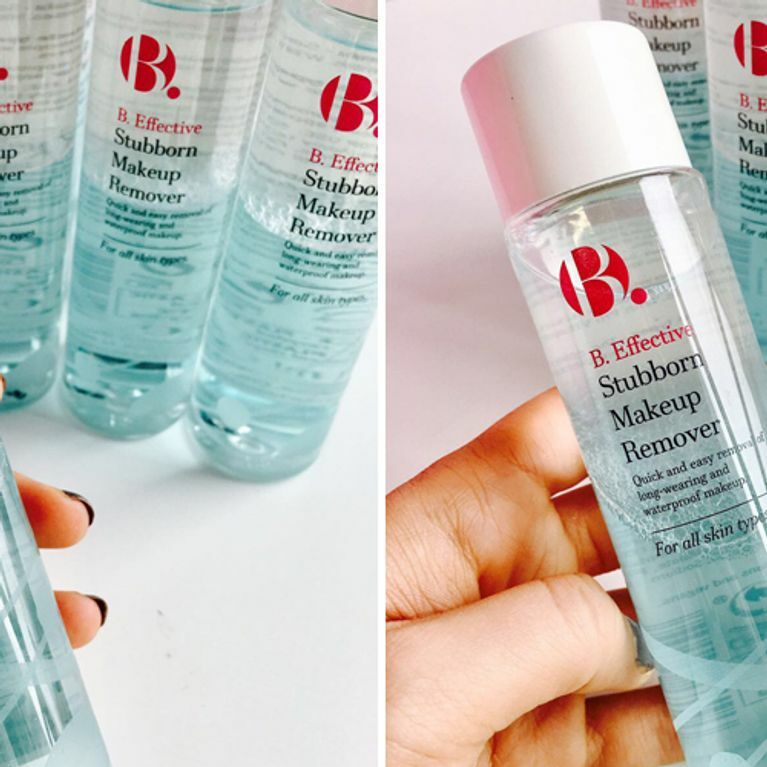 Fancy trying out the B. Stubborn Makeup Remover for yourself? Sign up to the latest Expert's Club test and you could be selected to receive a full sized product to try and review for free!